Hope House & Gardens is where we practice what we preach. Standing at the corner of Greydale and Puritan on the border of Detroit's Brightmoor and Old Redford neighborhoods, Hope House & Gardens is a gathering place and resource for neighbors and visitors. We currently serve the neighborhood with two programs: Art camps and classes through our partner, Live Coal Gallery, and the neighborhood demonstration garden. Click here to read about the neighborhood demonstration garden. To volunteer in the garden or on another Hope House project, click here. Click here to see a list of camps, classes, and events coming up at Live Coal Gallery. In 2011, Voices for Earth Justice purchased 5 lots with two buildings at the corner of Greydale and Puritan in northwest Detroit's Brightmoor neighborhood. The houses had been empty for five years, and were badly damaged. One section had to be deconstructed--see the video of the process above. With the help of neighbors, local partners and many volunteers, we have completed the rehab of one building as a caretaker cottage, and we are close to completion of the second building as a community center. Gardens were restored and three new flower gardens have been built. Area where rain garden will be built. 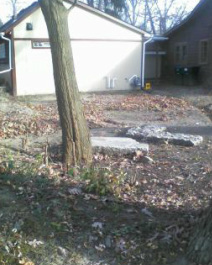 A grant from Freshwater Future is assisting with creating a rain garden in front of Hope House in the summer of 2014. What is a rain garden? A rain garden is a garden which takes advantage of rainfall and stormwater runoff in its design and plant selection. Usually, it is a small garden which is designed to withstand the extremes of moisture and concentrations of nutrients, particularly Nitrogen and Phosphorus, that are found in stormwater runoff. Rain gardens are sited ideally close to the source of the runoff, and slow the stormwater as it travels downhill, giving the stormwater more time to soak in, and less opportunity to gain momentum and erode the soil, or go in the sewers. Rain gardens are beautiful, and they provide habitat for many birds and butterflies. This is how the buildings looked when purchased in 2011. Front door of caretaker cottage during construction. Ed McCrary (right) installed exterior lighting on both buildings in February 2014. Board member Rodney Edmonds (far left) put up siding in the community center in April 2014. Sr. Janet Stankowski, (left) board president, led a group of gardeners in picking up leaves in fall 2013. 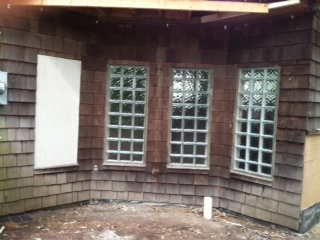 Newly installed glass block windows in rear of caretaker cottage. 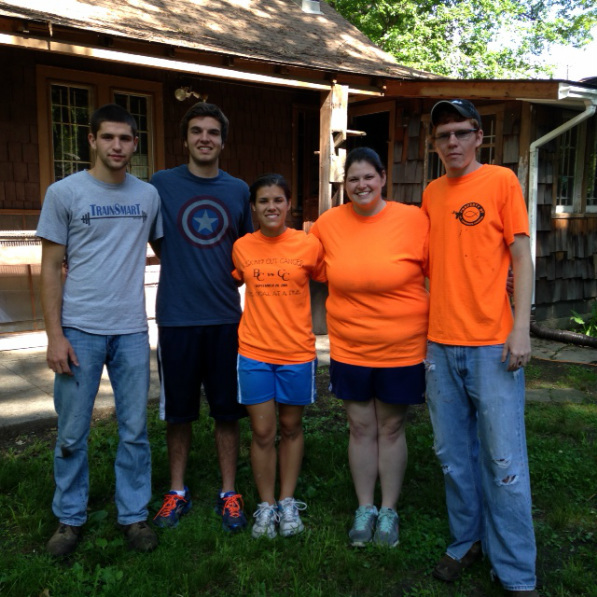 Five of the 300+ Catholic HEART Workcamp volunteers spent June 25 and 26, 2014 at Hope House. Thanks Connor, Peter, Maria, Rachel, and Will for painting, raking, weeding, and mulching. You made a big difference!